Thanks, Jennifer. So love horses with stars on their foreheads. It’s very romantic. Well, for me anyway! Thanks, Christine. I like the sunset colours and that pretty purple-blue tint. And the horse, of course! GGGRRRR – have tried to post my comment three times now!!!! 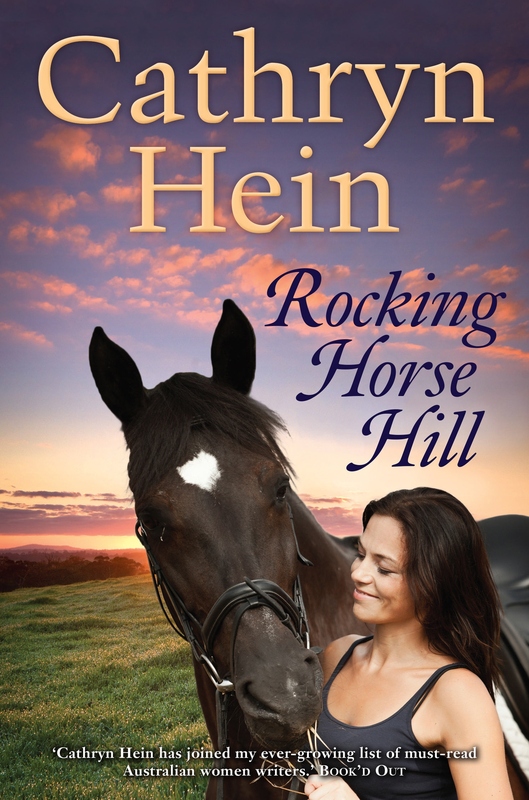 Try again… do love this cover Cath, and of course, can’t wait to read the tale!!! Oh, no! I hate it when that happens with blogs. Makes me seriously cranky. So sorry! Thanks for persevering, Amanda. I’m glad you like it too. I think it’s lovely! Ooh, so it is! What a laugh! Thanks, Joan. He’s (she?) is such a sweet looking horse with his head tilted that way. It’s a lovely image. But I’m a shocking sucker for a horse any time! Love the cover Cathryn – its beautiful. The blurb sounds very interesting – can’t wait to read it! Thanks Beck. I’m really pleased with it – the colours, the horse, the model. It’s really lovely. And if you look veeeeeery closely you can see a hill on the left which looks just like the Rocking Horse Hill of my imagination. Thanks, Juanita. I’m pretty damn pleased with it myself!!!! Have already told you how much I love this cover! Ha ha! Always nice to hear it again, Bernadette! I’m so thrilled at all the comments. Everyone seems to love it. Now all I can do is pray that the contents lives up to the cover. Eeek! Thank you, Bree! I’m sure you’re on the top of the review list and a copy will be winging its way to you in the not too distance future. Thanks Rach! Tis nice to squee with coverlove. Something you do all the time with yours. The cover fairies LOVE you!